The 2019 Tax Deadline to file your income taxes in the U.S. is Monday, April 15, 2019. 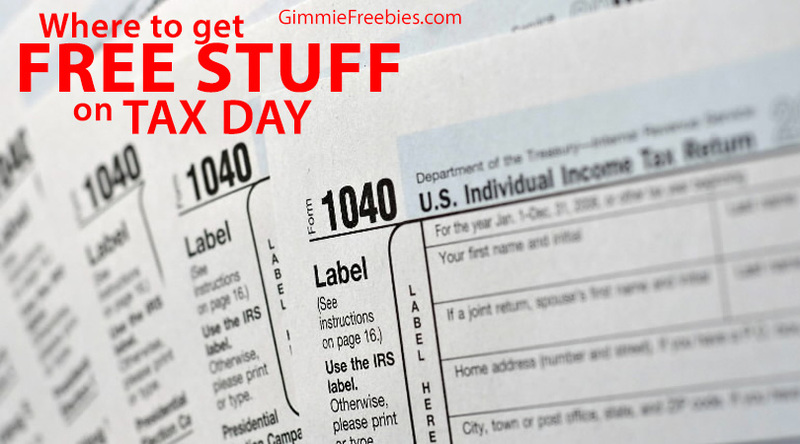 Our big list of Free Stuff on Tax Day has been updated! Get Tax Day Freebies 2019 and discount tax day specials when taxes are due. There’s only a few sure things in life: death, taxes and freebies! That’s why we round up a big list of Tax Day Freebies and Specials you can get on tax day. After all, you have to pay, why not get something free? But, whether you owe or are getting a big return, you can celebrate with free stuff found in our big list of Free Stuff on Tax Day! Are you done with your taxes? I always wait. Well, I shouldn’t say I wait, because that’s not entirely true. In fact, I sort of get a fairly early start. How long should you keep documents before shredding? The following list is being updated for 2019; items noted with a * are being verified for this year. Stay tuned! Bananas Smoothies & Frozen Yogurt – Enjoy a free small frozen yogurt on tax day. Just mention the freebie when you order. BJ’s Brewhouse – Save 1/2 off large Pizzas on Tax Day! Includes dine-in, take-out or delivery. Boston Market – This Tax Day Special offers a half chicken individual meal with two sides, cornbread and a regular fountain beverage drink, for just $10.40. Also, you don’t need a coupon, and you can get this from April 10 through 15 – both at the restaurant and for online delivery. *Bravo! Cucina Italiana – No sales tax on April 18. Mention tax-free day to your server. April 18. *BRIO Tuscan Grille – no sales tax on April 18. Mention tax-free day. Bruegger’s Bagels – File for 13 bagels and two tubs of Bruegger’s cream cheese for just $10.40 on April 15. Don’t forget your coupon! *Captain D’s – $10.40 deal meal on April 16 and April 17. *Chili’s – $5 Cuervo Blue Margarita special for Tax Day Tuesday. *Chuck E. Cheese’s – Tuesday through Thursday, buy one large cheese pizza, get one large cheese pizza free. 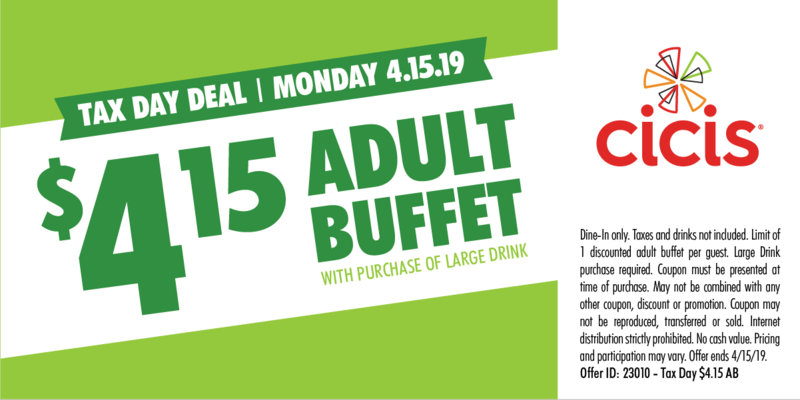 Cici’s Pizza – Adult buffets are just $4.15 with the purchase of a large drink. Just use this tax day special coupon. *Cinnabon – 2 free Classic Bites. Check with your local restaurant for participation. Corner Bakery – get two entrees for $10.40, April 15-17, available only for dine-in. Dunkin‘ Donuts – DD Perks loyalty members get a medium hot or iced coffee for $1 at participating restaurants nationwide. Farmer Boys – Pay just $10.40 for two Breakfast Burritos or two Double Big Cheeses on Monday at participating locations. No limit, and no coupon required. *Firehouse Subs – April 17- April 19. Buy sub, chips, and drink and get one free sub with coupon. Fresh Brothers – pizza for just $10 in honor of Tax Day 2019 on 4/15 and 4/16. *Godfathers Pizza – large 1-topping pizza and Monkey Bread for just $10.40. Use code: 8011E. April 18 only. Great American Cookie – Red, White and Chocolate Chip! Like it or not, Tax Day is a necessity for Americans and Great American Cookies® will be making the day a little sweeter by offering one FREE Original Chocolate Chip Cookie to customers who stop by participating stores on Monday, April 15. Grimaldi’s – Enjoy a 16-inch traditional cheese pizza for $10.40! Hardee’s – Free sausage biscuit from 7-10 am. Just say “Made From Scratch” at the counter. *Hooters – kids 12 and younger get a free kids meal eat with an adult purchase of $10 or more at participating locations until April 17. Hot Dog On a Stick – Free original turkey or veggie dog at participating locations for Tax Day on Monday, April 15. Limit one per customer, and no purchase necessary. *Hungry Howie’s: April 15-17 for online carryout orders only, get a one-topping medium pizza for 15 cents with the purchase of a one-topping large pizza at regular menu price. Use code 18TAXDAY. *IHOP – Kids under 12 eat Free for the whole month of April, between 4:00 pm and 10:00 pm. Find your closest IHOP here. Jet’s Pizza – Pay just $10.99 for a single topping, eight corner pizza using coupon code TAXES. Kona Ice – Celebrate Tax Day, aka “Chill Out Day” on April 15. Stop by a Kona Ice truck during select hours Monday for a free cup of tropical shaved ice. McDonalds – select locations will be offering a free small coffee, or a Quarter Pounder for 18 cents when you buy a Quarter Pounder. Or, a BOGO for 50 cents Big Mac! After all, be sure to call to see what your local McDonalds may be offering this year. Mountain Mike’s Pizza: Take $3 off any large using code 481658 or $8 off any two large pizzas using code 883457 for tax day. National Parks – Free Admission! Besides bringing you tax day freebies 2019, it’s also National Parks Week starting April 20th! Noodles & Company – $4 off any online order of $10 for Rewards Members. The offer is valid from April 10-15, but to get the offer you need to be signed up for the program by April 9. Office Depot – use the free paper shredding coupon for 5 lbs of free document shredding through April 27! *Orange Leaf Frozen Yogurt – check with your local Orange Leaf for any specials they may have on April 17. *Papa Murphy’s Take ‘N’ Bake Pizza – two large pizzas for $10.40 on April 18. *The Palm – free Prime Bites appetizers with purchase. April 18. *P.F. Chang’s – Coupon for a free appetizer with purchase just text “CRAVE” to 242647. Plant Fitness – From 4/11 through 4/20, stop by and get a free HydroMassage with coupon which will be available starting 4/11. Pizza Hut – Any large two-topping pizza for $5.99 w/online carryout orders, through Monday. Pot Belly Sandwiches – Score BOGO Free entrée at locations nationwide! Just mention that it’s Tax Day. *Quizno’s – 10.40 percent deduction off any purchase including catering, on April 17 to Toasty Points loyalty app members. *Red Lobster – Coupon for $5 off two dinner entrees or $3 off two lunch entrees. Coupon expires April 22. *Rubio’s Coastal Grill – April 17 Tuesday taco specials are available all day instead of only during select hours. *Rock Bottom Restaurant – $5 off of any $15 purchase. Good until April 21. Sauce Pizza & Wine – beer and wine are $4.15 on Tax Day 2019 when you dine in. Slim Chickens – $5.99 Chick’s Meal on Tax Day! Meal includes three tenders, two pieces of Texas Toast, a side and a medium drink. Smoothie King – save $2 on a smoothie from 4/15 – 4/18. For more info, visit www.smoothieking.com/taxday. You can also sign up for their free app. *Sonic – half-price cheeseburgers- check with your local Sonic for offers they will have on Tax Day, April 17. Tijuana Flats – $5 burritos Monday at all locations! *Tony Roma’s – Through 4/17, dine-in guests will receive a free Kickin’ Shrimp coupon with the purchase of an adult entrée. TooJay’s Deli – Burger and beverage combos are just $10.40 at any of TooJay’s 28 locations across Florida with this coupon. White Castle – Through Tuesday, get 15% off any in-Castle purchase. If you subscribe to their email, then they’ll send you the coupon. Otherwise, you can get one on their Facebook page or Twitter. Know of any Tax Day Freebies 2019 that we missed? Let us know! Don’t miss all of our Birthday Freebies in our HUGE List of 500+ Free Gifts on your birthday! From food to goodies, AND LOTS MORE! We have it all! Go HERE and get yours!